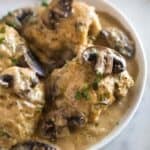 This easy Instant Pot Chicken Marsala recipe is one of the tastiest dishes I have made in my instant pot. Perfectly cooked chicken thighs with cremini mushrooms cooked in a sweet marsala wine mixture and served with pasta or mashed potatoes. Select SAUTE on the Instant Pot, and add 2 tablespoons of olive oil to the instant pot. Season the chicken on both sides with salt and pepper, and dredge them in flour. Add chicken thighs to the hot oil and cook them for 3-4 minutes on each side, until golden brown. Remove the chicken thighs to a plate. Add the last tablespoon of olive oil to the instant pot along with the mushrooms, green onions, and garlic. Saute for 2 minutes and then press CANCEL. Add the chicken broth to pot, scraping up any browned bits from the bottom of the pan. Place the chicken thighs on top. Close the lid and turn the pressure valve to "sealing". Cook on Manual/Pressure setting and cook for 10 minutes on high pressure. When the timer beeps, allow the pressure to naturally release for 12 minutes, before opening the lid. Press cancel and remove the thighs to a plate. Cover them with tinfoil to keep warm. Turn instant pot to SAUTE setting and add the marsala wine to the mushroom mixture. Bring the mixture to a boil and cook for 3 minutes. Stir in the heavy whipping cream and cook for an additional 5 minutes or until the mixture is slightly thickened. Spoon the sauce over chicken. Serve warm with mashed potatoes or egg noodles. I HIGHLY recommend using chicken thighs, instead of chicken breasts for this recipe because they cook so much better in the instant pot.